Through the company’s newly introduced 4G Connect plan, customers who purchases devices will be provided with 200MB of free data every month for 2 years, right out of the box. T-Mobile’s move is very reminiscent of what Google has done with Chromebooks by providing a limited quantity of data with purchase all while offering upgrade options for extra data usage. 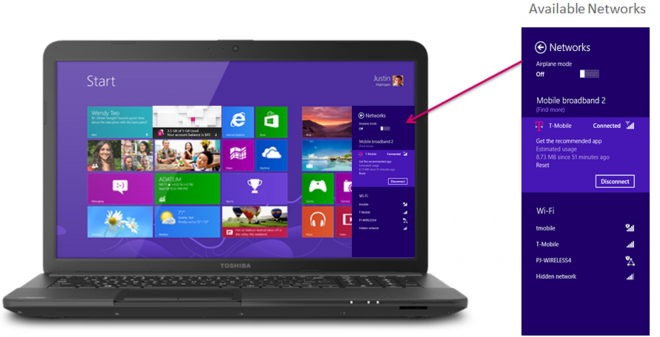 The first devices to support T-Mobile’s 4G Connect program include select Windows 8 notebooks and ultrabooks from Dell and HP, including the HP Pavilion DM1 and Dell Inspiron 14z. Device pricing will vary, and users who require more than the allotted 200MB of data per month can upgrade to T-Mobile’s flexible no annual contract passes, which start as low as $10 per GB. 4G Connect will be available to any customer who purchases a supported device, not just existing T-Mobile customers. Today, at the Consumer Electronics Show (CES), T-Mobile USA, Inc., announced 4G Connect, an innovative program that breaks away from the wireless industry and provides customers with value and choice on more devices than ever before. 4G Connect is a breakthrough program designed to make 4G connectivity a standard, integrated and free feature on select notebooks, tablets and Ultrabooks™. Through 4G Connect, consumers who purchase these devices will be able to easily access the Internet out-of-the box, through a high-speed connection via T-Mobile’s fast and dependable nationwide 4G network — all with no extra equipment, annual contracts or commitments. Wireless data usage is on the rise, and more people are turning to 4G-connected devices when Wi-Fi is not available. Often, consumers have had to invest in additional equipment and service plans, on top of device costs, to access data, which can be cumbersome and costly. With 4G Connect, T-Mobile is bringing consumers an easy and valuable connected experience and business model: a free 4G solution that’s easier than Wi-Fi. The 4G Connect program is also a great way to introduce new customers to T-Mobile’s nationwide 4G network, which is available in 229 markets, reaching well over 220 million people. In addition, with the always-on connectivity features of Windows 8, only T-Mobile is providing customers with a free nationwide 4G option for a fantastic Windows experience. Device pricing varies; all-in costs for a device with the free connectivity begin at less than $500. Depending on which device is selected, customers can take advantage of up to 200 MB of free data per month for up to two years. Users who require additional data capacity can take advantage of T-Mobile’s flexible no annual contract passes, which start as low as $10 per GB and can be purchased whenever consumers need additional data. Customers can also purchase monthly or annual contracts if they want larger amounts of data for longer periods of time. 4G Connect is for any customer who purchases a supported device, not just T-Mobile customers, and will introduce all to T-Mobile’s nationwide 4G network. In addition, with the always-on connectivity features of Windows 8, only T-Mobile is providing customers with a free nationwide 4G option for an always-connected Windows experience. “By enabling the HP Pavilion dm1 with two years of service through T-Mobile’s 4G Connect program, we’re making sure that our customers enjoy a simple, easy computing experience. We’re working with T-Mobile to make 4G connectivity an integral part of our ultramobile products,” said Todd Achilles, vice president of mobility at HP. T-Mobile will continue to grow the program, working with additional OEMs and retail outlets to provide 4G Connecton a broader range of devices to consumers in 2013. Registration required for service. Service starts on date of customer registration and is not available everywhere. 4G connection speeds will vary due to location, environment, network conditions and other factors. Available in the United States only. Are they serious? 200 MB “free” then $10/GB after that? I hate free things too…. Clearly this product isn’t for you. They can’t legally charge you without your consent, all they can do is tell you to stop or else they’ll close your account. Tell at&t that. When they detect the service being used on their network, bam, you now have tethering charges. Well, for T-Mobile’s 2GB data only plan, they charge $39.99/mo. 5GB is $49.99/mo. 1.5GB prepaid T-Mobile data is only $25.00, how is 2GB $39.99??? Well, the prepaid shuts off when you hit the 1.5GB. The standard data plans keep you going, just at a throttled rate. I’m a Chromebook owner and I frequently use the free data that came with my device when on the run and something needs my attention. I paid more upfront, but have it “just in case”. I can pay a monthly fee for more data via Verizon, or I can insert a GSM SIM (or tether, or a USB dongle), so I’m not restricted to my allotment by any means. I’ll actually be watching this space when the next Chromebook is released – could Google’s next partner be T-Mobile instead of Verizon? Possibly a dual service? I’m excited, as both a T-Mobile customer and as a Chromebook owner. need chromebook + tmobile 4G ! I know there are some HP small laptops (aka premium netbooks) having this. Since I have $40/5GB webconnect already, I just switch SIM and call it a day except T-Mobile change the rate to $10 for first GB and $5 per GB thereafter.